BEIRUT — A number of analysts and security experts who specialize in intelligence and security subjects in Lebanon and France have expressed this week shock at the way many Western authorities, including several in Europe and the United States, are avoiding engagement with the Syrian authorities and thus missing important avenues to help end the crisis in Syria. Discussing the reasons preventing those authorities from changing their stance, the acknowledge expert concluded that Western political authorities, including the White House, believe that the Salafist movement’s attacks can be controlled through countries such as Qatar and Saudi Arabia. Hitherto, the relationship with Bashar Al-Assad has proven his independence as well as his adherence to the policies that bound him to Iran and other anti-Israeli organizations. However, French, European and American security officials perceive this differently. Most Western intelligence apparatuses sounded out their danger sirens pointing to the necessity of cooperating with Syrian security authorities. This is because the Syrian intelligence is still considered the most effective party facing Salafist movements in the Middle East, and the Syrian army is fighting “terrorist/jihadists” on a daily basis. In this context, the Syrian intelligence never lost the penetrations it had into Al-Qaeda and other Syria-based Salafist movements as part of it work of planning to neutralize future terrorist attacks. To this end, Syrian intelligence committed substantial resources and senior officers in pursuit of international terrorists who are currently based in Syria, but who are laying the groundwork for terrorist attacks soon to be executed in European capitals. 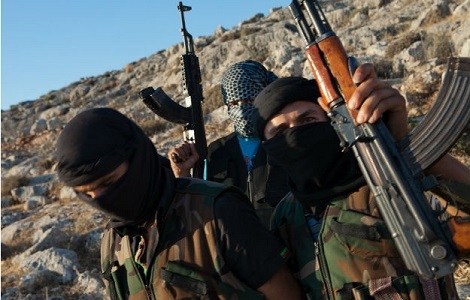 While the United States and its Western allies are offering military, media, financial and political aid to the armed opposition in Syria, allied with Al-Qaeda and like movements, the Syrian intelligence continues to fight against terrorism on behalf of the world, but with no assistance from countries whose interests and people they are work to protect. One expert posed a rhetorical question, “Imagine that an assassination as big as that of the ‘Crisis Cell’ officers in Syria was executed during the time when we discovered that among the victims was one of the most cooperative Syrian people with the French intelligence services in the fight against terrorism. And what have we done to protect it? Nothing.” However, as the Syrian story puts it, the Americans might well have been involved with his assassination. For his part, the security expert and former Lebanese Army General, Elias Farhat, argued recently that security operations targeting senior Syrian officers do not only affect Syrian security, but are undermine operations for weakening international security and strengthening terrorists around the world. This is because the Syrian role is viewed even by the US Intelligence Community as being effective in fighting “international terrorism”, and had it not been for the cooperation the Syrians provided to Western security services, “terrorist organizations” would have succeeded in many attacks on European capitals. Indeed, Maj. Gen. Ali Mamlouk, who was largely responsible for security cooperation to combat international terrorism between the Syrians and the West in the past decade, was subject to the sanctions imposed by the United States and Europe. In addition, the “Crisis Cell” operation, which participated in the assassination of agents who were undoubtedly related to the West, resulted in the death of a number of Syrian officers who were responsible for some key security cooperation between Syria and the West. The West is killing and sanctioning many of those who provide it with help. The West killing senior Syrian intelligence officers who are some of the key individuals fighting terrorists, who are in turn ostensible enemies of the West, which claims to fight terrorism while taking measures to intensify political, economic, security, and media pressure on Syria and its officers and leaders, is self-destructive. It is these Syrians who are considered among the most effective forces combating global terrorism. While Al-Qaeda and the West are working hand-in-hand in their fight against the Syrian army, the West is also busy conspiring against Syria, while engaging in, and aspiring for, the formulation of yet more sanctions against the population of Syria in order to achieve a purely politically motivated regime change. These sanctions are in fact resulting in the rise to power of fundamentalist groups promoting terrorism. Moreover, there is no benefit for Europe in such a policy, as it targets those who offer help by killing some of their officers, imposing sanctions on others, and aspiring to transfer others to the International Criminal Court. Those being punished are the same people helping fight terrorism on behalf of the world – as with the cases of Colonel Hafez Makhlouf, Maj. Gen. Ali Mamlouk, and the officers of the “Crisis Cell”. In both the Makhlouf and Mamlouk’s cases, both were blacklisted and sanctions were imposed on them by the United States and Europe, preparatory to transferring them to the International Criminal Court. However, this did not detour either gentleman from continuing to combat terrorist organizations funded by the West to fight President Bashar Al-Assad’s regime. These organizations are working in parallel and currently are planning terrorist and security attacks in Western capitals, despite the fact that a number of Western and Jordanian officers have repeatedly certified that Colonel Makhlouf achieved numerous successes in the field of security, especially in the fight against international terrorism. Makhlouf’s efforts resulted in saving the lives of many Westerners who were targeted in their home towns by Al-Qaeda’s assets in Syria who operate a planning center. Makhlouf also arrested a number of senior terrorists in Damascus who confessed to planning for operations that were halted through the information offered by the Syrians to the West via intermediary security organizations in the Middle East. When the French requested that the cooperation with the Syrians be restored, their request was turned down, pending the French governments ending its fighting alongside the terrorists in Syria. This is one subjects that is reportedly being analyzed by the by US Intelligence Community. It is to be hoped that Washington and Brussels listen and act appropriately. If so, they will avoid a steep price for their currently flawed policy.